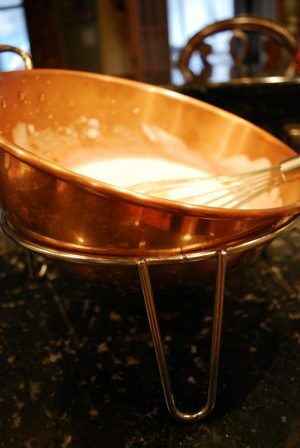 I always wanted a copper bowl for whipping egg whites as I’ve always heard it makes them better. After some research there is real science behind why a copper bowl reacts with egg. Most folks might use a mixer to make egg whites and some might accidentally have whipped them till they break, turn grainy and expel moisture. The reason is why people eat egg white omelets, egg whites are packed with protein. In addition, if you’ve ever felt like eggs smell like sulfur you would be correct again. The sulfur molecules interact with the protein strands to make tight bonds. So tight they actually squeeze the water right out and create little knots. The Copper bowl releases particles which interact with the Sulfur in effect neutralizing it while the copper ions allow the protein to form longer loose strands trapping more air and retaining moisture. Interestingly the color of egg whites whipped in copper have a light yellow hue. If you can’t get your head around the price of the 2.5 pounds of a fancy copper for whipping eggs you can always fall back on Grandma’s trick of adding a bit of cream of tartar to the whites. It has a similar effect on the whites, but certainly not the culinary cool.